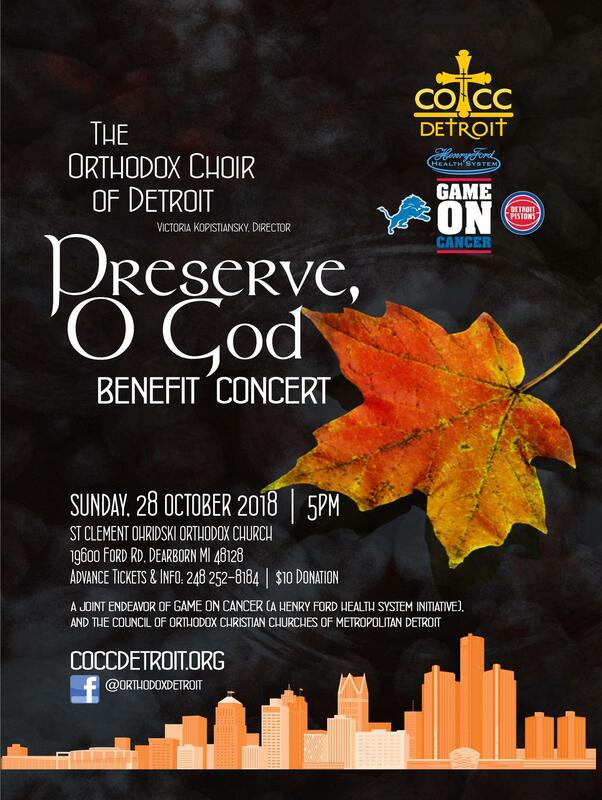 DETROIT, MI [COCC] -- The Orthodox Choir of Metropolitan Detroit, under the auspices of the Council of Orthodox Christian Churches (COCC), will hold its eighth annual Benefit Concert on Sunday, October 28 beginning at 5:00 p.m. at St. Clement Ohridski Orthodox Church located at 19600 Ford Road, Dearborn MI 48128. The Orthodox Choir of Detroit, under the directorship of Matushka Victoria Kopistiansky, consists of over 40 volunteer singers from various Orthodox Christian parishes in Michigan. This year’s concert will partially benefit the work of Game On Cancer, a Henry Ford Health System initiative to fight and win the game against cancer. Game On Cancer provides assistance to patients that removes barriers to cancer care and provides critical cancer research funding. 100% of funds raised through Game On Cancer are directed to their mission (40% of funds are directed to patient assistance, 30% to research, and 30% to supportive oncology programs). The concert is open to the public. Tickets are $10.00 in advance and at the door. For advance tickets, contact COCC President Olga Liskiwskyi at 248-252-8184 or olgaliss0910@gmail.com.